Goji Berry | Gurney's Seed & Nursery Co.
Used in traditional Chinese medicine for thousands of years, Goji berries are extremely nutritionally dense and high in antioxidants. Claimed to enhance the immune system, improve eyesight and circulation, and protect the liver, Goji berries are truly a superfood. Bright orange-red, 1/2- to 1-in. berries have a slightly sweet, mildly tangy flavor. Berries can be eaten fresh, made into juice, wine or herbal tea, or dried and enjoyed as a snack similar to raisins. The Goji shrub will grow 8-10 ft. in full sun to partial shade, with emerald foliage on graceful, vine-like branches. Star-shaped blooms in shades of white, lilac and purple will appear in early summer, with fruit ripening in July. It will continue to fruit and flower until heavy frost. 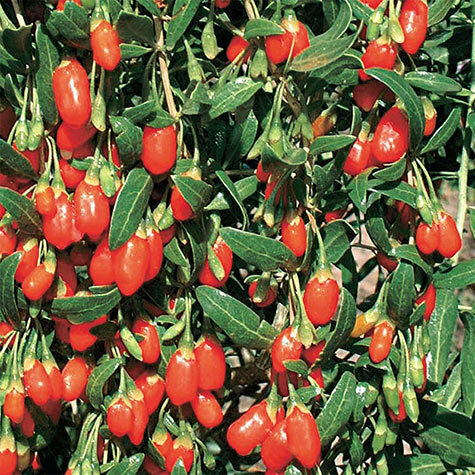 With no known pest or disease problems and high tolerance to drought, once established, the Goji shrub is an easy plant to grow. Zones 5-9. 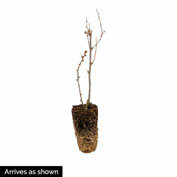 Depth: Plant at the same depth as the nursery pot. Plant in a sheltered location. Light Required: Full sun 8-10 hours of sun per day. Color: White to lilac to purple colored blooms. Foliage: Glossy emerald-green elongated leaves, on graceful vine-like branches. Blooms: Early summer followed by sporadic blooming the rest of the growing season. Fruit: Glossy bright orange-red fruit, oval 1/2 inches long. Harvest fruit when it is 80-90% ripe. Self pollinating. May take plants up to the third year to bear fruit. Flower Form: Small clusters of funnel shaped blooms. Soil Requirements: Will grow in almost any type of soil, except wet soggy soil, tends to fruit best in well-drained soil of moderate quality. Likes an alkaline soil with a pH of 8.2 - 8.6. Pruning: Heavy pruning will help keep the plant looking nice, and increase berry production. Can also be trained to a support. The older the plant, the more upright it can be trained. Comments: Absolutely packed with crucial vitamins and antioxidants, it's easy to see why many call the Goji Berry a super fruit! This wondrous little gem offers incredible immune-boosting qualities in a convenient, bright red berry. Popular in China for centuries, the large 1/2 to 1" berries have a sweet flavor that falls between a cherry and a cranberry. 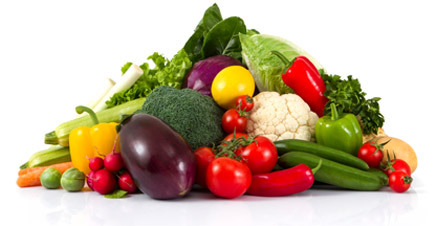 Eat them raw, dried, in smoothies, salads or in a variety of dishes-just make sure you eat them! This berry's one nutritional powerhouse you don't want to miss! Often referred to in health stores as the Tibetan or Himalayan Goji Berry. Extremely nutritionally dense, high antioxidant properties. Can be eaten raw, dried, made into juice, wine, herbal tea. When dried they can be eaten as a healthy snack similar to raisins. They have a taste which has been described as having an accent of tomato, similar to dates, dried cranberries or raisins, but drier, more tart, less sweet and with an herbal scent. Fresh berries are juicy and sweet.